I turned 20 last week and thanks to many loving friends and family, I had a great birthday weekend. In the midst of it all, I of course failed to get some OOTD shots but here are some snippets of my birthday so enjoy! I love this mug & I was very amused that all the servers’ shirts say ‘eat like you give a damn’ on the back. I wanted to get something that I can’t make at home, like an omelette, so I ordered the Smoked Salmon Eggs Benedict with potatoes. If you’re a fruit lover and not allergic like me, you should order something that comes with a trip to the toppings bar! The whipped cream looked amazing but I just admired from afar. I prefer my brunch to be more salty than sweet anyway! The best part of my weekend was my roommate and another one of my best friends co-planning a surprise for me! I wish I had pictures of the other details, but here’s some evidence of just how perfect everything was. I love bunting and my roommate handmade this! Even the painted canvas with my nickname on it. I’ll be back soon with a review on the monthly beauty subscription, Birchbox, and the Pop Beauty Bright Up Your Life palette that I ordered with my points! I’ve temporarily canceled my subscription – so I’ll be explaining why. Thanks for reading! If you helped me celebrate my birthday or wished me a happy 20th, thank you so much! This is going to be an exciting decade, I can’t wait for the adventure! We started out by going to a tried and true favorite ramen restaurant, Ramen Man. The signage makes me happy and you definitely won’t miss it along the busy main street it’s located on. Ramen portions are filling, all under $10 unless you choose add-ons, and are served with unlimited boiled eggs. I tried the Garlic Tori-Paitan Ramen which wasn’t as overwhelming as it sounds. The broth is both creamy and rich. If you really like char siu, I would recommend adding extra because there are only a few pieces. While wandering around the Wallingford Center, we met Debbie – the owner of an adorable, tiny vintage shop called Indie Frock. Debbie was really sweet and even posed for me to take a shot of her in the beautifully decorated shop she created to resell all sorts of boho goodies. (Really loved her distressed denim and the flower crown!) You can like the shop’s Facebook page here! The shop is small enough that I fit it all in this shot! Side note: I love thrifting and some of my favorite pieces are either vintage or from recycled clothing stores. I’ve come across some ridiculous deals – thinking that will be in an upcoming post if anyone’s interested! One man’s trash really is another man’s treasure. The Trophy Cupcakes shop inside has some rooms for parties and just for enjoying your cupcake and the decor is too cute. The different themes are all up my alley – in fact, some of this seems familiar…does my room resemble a cupcake shop?! Maybe. 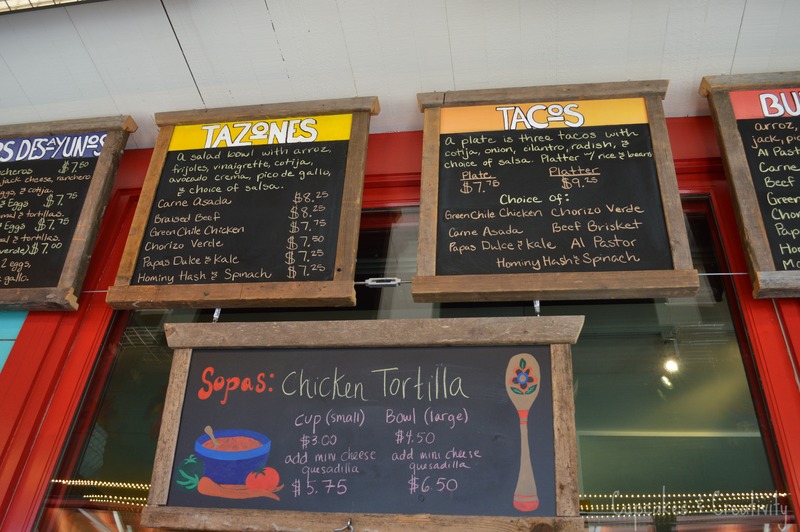 Next stop, we tried the churros at TNT Taqueria, that offers taco truck foods in a small restaurant setting. For those of you that care, TNT uses environmentally friendly packaging and gets ingredients from local farmers. They even use grass fed beef and other quality ingredients. Sadly, the only other churros I’ve had are from Disneyland and Costco. Actually, I happen to love both of those places and find happiness in either so it’s not so sad. However in terms of churro quality, TNT’s definitely beats theirs. (Duh.) You won’t get your churro right away because they make them fresh and it’ll be piping hot when you get it. The outside is crispy and has plenty of sugar and cinnamon while the inside is doughy and very light and airy. Another “must have” in Wallingford that I’ve heard so much about is this gelato shop, Fainting Goat. You can buy handcrafted gelato and even molten lava cakes here from 12-10 PM daily. I tried my friend’s coconut gelato and it was very rich and creamy, as gelato should be. The extra kick that it had was actual coconut shavings that tasted fresh, not processed. If you’re into rich sweet treats, I would recommend Molly Moons too – there’s a location right on the same street in Wallingford! You will find literally any type of sock you can think of. All different lengths, sizes, and designs. They sell men’s, women’s, unisex, children, even baby socks. I saw leggings, leg warmers, and even tights. If you like Strideline socks, they have them too! Below is only a tiny portion of the selection they have. For not being a “sock person”, this store makes me want to be. I just have to justify paying around $10 for a pair of socks. Maybe one day. But if you’re scrambling to find a gift for someone, this is a great place to get started. Check out the fun dinosaur socks that my friends bought! Top|H&M. Denim jacket|A&F. Skirt|Boutique in Las Vegas. Booties|CottonOn. Tote|Longchamp. I’m a big fan of my mom’s banana bread so I wanted to share the super simple recipe that she uses. Keep reading to see how to make this yummy, relatively healthy treat! *Use unsalted butter. If you only have salted, just don’t add the 1/2 tsp of salt. Let’s get started! My mom’s trick is to make banana bread whenever there are leftover bananas that are too ripe (oops) for eating. Clearly these bananas aren’t going to be good for eating anymore but they make a perfect loaf of banana bread. Try to set the butter out before you bake for a few hours so that it softens. If you forget to do this, just microwave it so that it’s not rock hard from the fridge. Now mash the bananas. You don’t need a fancy tool like this, a fork will do. The bananas will be so soft that it doesn’t take much time or effort. Looks appetizing, doesn’t it? I won’t lie – the smell wasn’t too pleasant either. Overripe bananas are lethal. Add the other liquid ingredients like eggs and butter. Now add the dry ingredients so this pile of mush starts looking like a real batter. You can pour all of the batter into one loaf pan to get bigger slices, however splitting it into two pans will help it bake a little faster and yield more slices which is always good for sharing :) Spray pans with Pam or cooking spray of your choice and bake for 50-60 minutes at 350 degrees F.
Let me know if you try this recipe! It’s delicious I promise. The great thing about it is it stays moist, in fact I think it gets more moist as you leave it out for a few days. You can even freeze a loaf if you want to save it for later. Thawing it doesn’t take away from the taste at all. Thanks for reading as always!